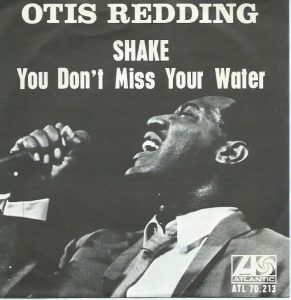 Generally recognized as both his first true masterpiece as well as the best album Otis Redding made in his lifetime, the cannily-titled Otis Blue: Otis Redding Sings Soul is definitely a landmark in his career. Like his previous albums, it was a mixture of originals — including “Respect” and “I’ve Been Loving You Too Long,” — and covers of some of the greatest songs ever written, including Smokey Robinson’s “My Girl” and Jagger-Richards “(I Can’t Get No) Satisfaction” which replaced the fuzz guitar with the horns that Keith Richards had in his head for the song in the first place. Yet another showcase for the talents of drummer Al Jackson, Jr, “Shake” kicks off with Jackson battling the horn section, sometimes echoing them, sometimes spinning and rolling while they’re blaring and blasting. If you listen hard enough, you can hear bassist Duck Dunn and guitarist Steve Cropper on the verses, but the choruses are pure blasts of rhythm while Otis preaches the fun of, well, shaking. In the grand tradition of dance songs about the fun of dancing, you don’t really listen to “Shake” for the lyrics, you listen to “Shake” cos it makes you want to dance, and every single time they get to the stop-time parts where Jackson’s just making up beats and rolls on the spot while Otis is exhorting and the horns are trying to keep some semblance of order, only a dead person wouldn’t want to just get up and dance. And even some of them.